Digital dentistry has a lot of benefits, but it also creates new challenges. You not only have to be concerned with taking care of patients and running a business, but also with the information technology that runs your practice. It can get complicated. Dealing with outdated hardware, software licenses, non-secure firewalls, inefficient backups, and unmanaged network solutions can be outright overwhelming. In response to these concerns, TechCentral by Henry Schein One, created OmniCore, an all-in-one dental practice “network in a box” with components designed to work in harmony. 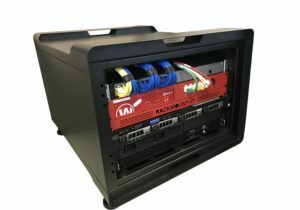 Everything you need for your network comes in a sleek, mobile, low-profile rack that can be easily rolled into your dental office. Maintenance and management, remote monitoring, software licensing and updates, hybrid data backup, and support services are also included as part of the monthly subscription fee, so you can truly set it and forget it. With a fixed price, hassle-free repairs and no yearly commitments on the contract, you can leave your network troubles behind and get back to focusing on the excellent care you provide your patients. A practice can lose thousands of dollars — and valuable staff productivity — when IT issues compromise computer systems and data security. OmniCore helps prevent these problems by keeping your hardware and software up to date, using a business-grade firewall to help thwart viruses and backing up your practice data. With OmniCore services, your network is monitored remotely. With unlimited access to TechCentral Support, you can resolve IT issues, in most cases, right away, saving you expensive downtime. Using OmniCore means you don’t have to spend time or money purchasing, installing, and maintaining your network infrastructure or worrying about updates. Now you can focus on your patients again, and ditch the role of a part-time IT tech who has to deal with frustrating IT issues. Think of the time and money you invest in keeping your network hardware healthy. Additional costs can become exponential when you factor in important services like remote monitoring, reporting, management, a support plan, and data backup. In fact, you can easily exceed the monthly cost of OmniCore, which includes all these services and more. With OmniCore packages starting at $500/month, you could enjoy a stress-free network with one easy-to-budget monthly payment. Because TechCentral is part of the Henry Schein One family, we have the buying power; agreements with industry leaders like Dell, HP, and WatchGuard; and the ability to deliver, support, and back up the OmniCore solution. It’s time to stop stressing about your practice’s IT and get back to doing what you love — dentistry. Find out more about OmniCore at www.HSTechCentral.com/OmniCore/SideKick or by contacting TechCentral today at 844.588.6590. About the Author: Donovan is a technology enthusiast that has worked in the IT industry for over 15 years, 10 of which have been with Henry Schein TechCentral. He has an unquenchable thirst for knowledge in all things related to technology from quantum computing to circuit engineering and flying FPV drones. Donovan has been an integral part in managing valuable relationships with various large software and hardware companies to vet out the most ideal IT solutions for the unique needs of the dental market.